Home Cover Feature FOUND A PEANUT FOUND A PEANUT JUST NOW! FOUND A PEANUT FOUND A PEANUT JUST NOW! 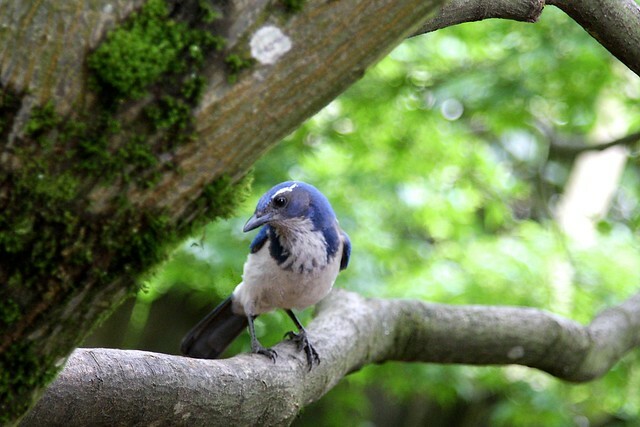 THE SCRUB JAY WAS ABOUT 3 FEET FROM ME WHEN I TOOK THIS SHOT. THEY ARE VERY BOLD! 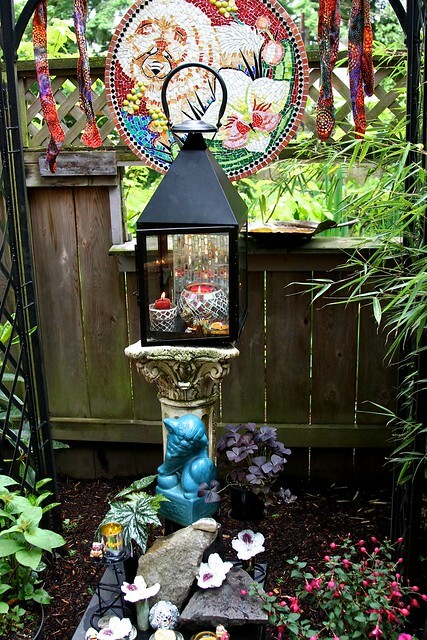 Yesterday I was waiting for the guy to get here for an exterior house painting estimate and enjoying my redecorating job in the front yard when I spotted the jays and squirrels peering out from the trees (“THE FOREST HAS EYES” is a great expression). 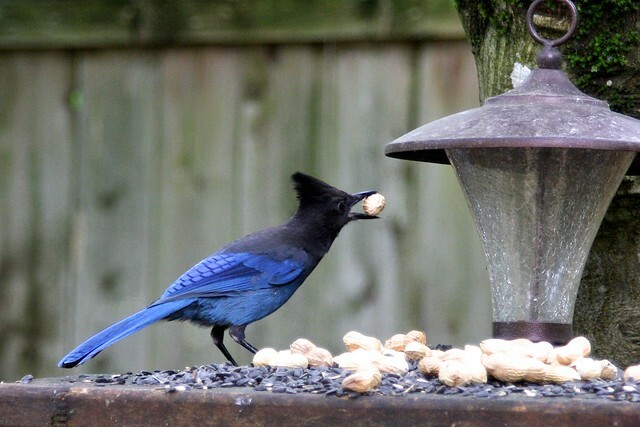 I decided to grab my camera and tripod and the bag of peanuts and invite the kids down for an early brunch/photoshoot. 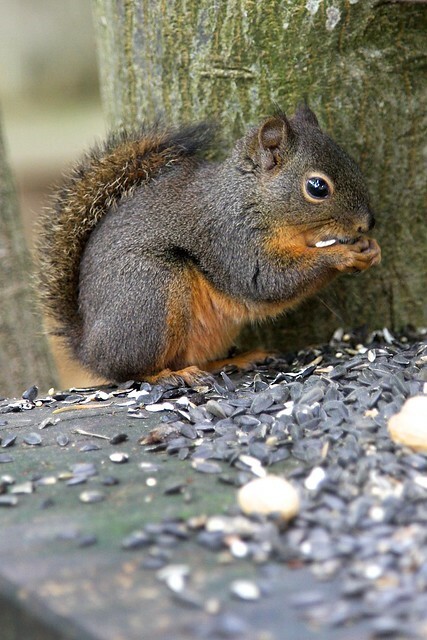 There was quite the competition going on at the feeding plarform between the STELLERS JAYS, SCRUB JAYS and my DOUGLAS SQUIRREL (who is a “peanut” himself hes so small and bright red) . 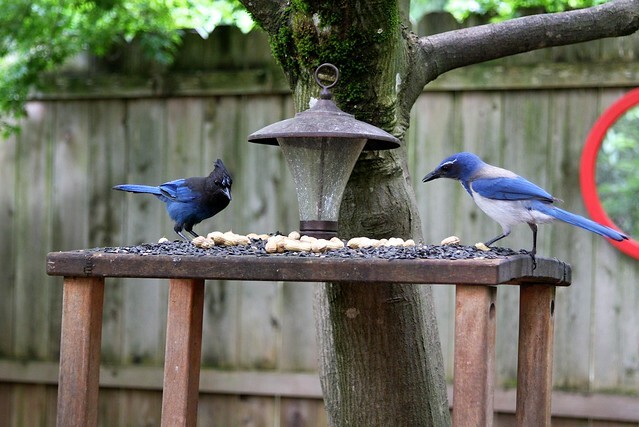 This jay was very leary being in the same space as little “Dougie”, who will defend his food space like a lion!! I have a beautiful clutch of 3 Stellar Jay babies who have been starting to forage for their own fook and are they a joy to watch growup. 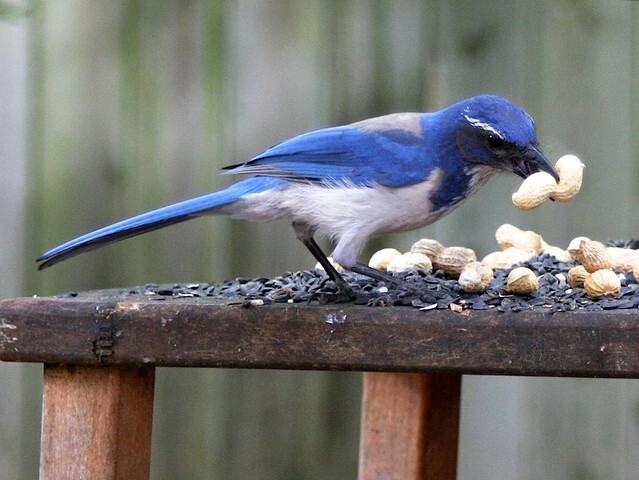 The Stellar and Scrub jays are always bickering ……usually the larger Scrub Jay wins, so this guy had his eye to the sky and was very quick to grab a peanut and run. This is a nice comparison of the two jays side by side. The youngster to the left has pin feathers coming in on his forehead….so cute!! Hope you enjoyed the pix!! Have a wonderful week my friends and check out the FOUND A PEANUT video below to keep that tune a hummin in your head all day!! These kids are so adorable. I love watching their expressions as they sing. 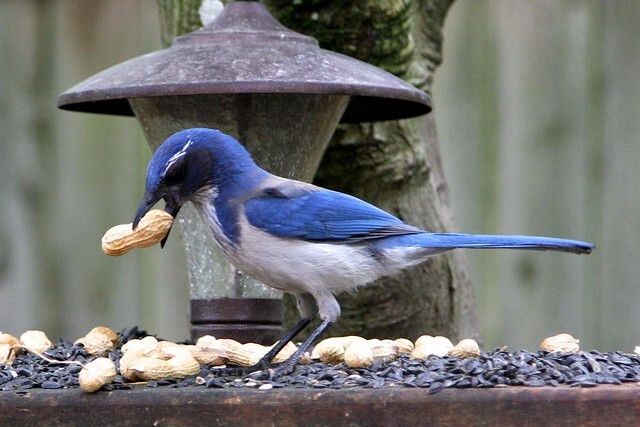 Sandy, what you call a scrub jay, I was always taught was a Camp Robber. Interesting what different bird folks call them. 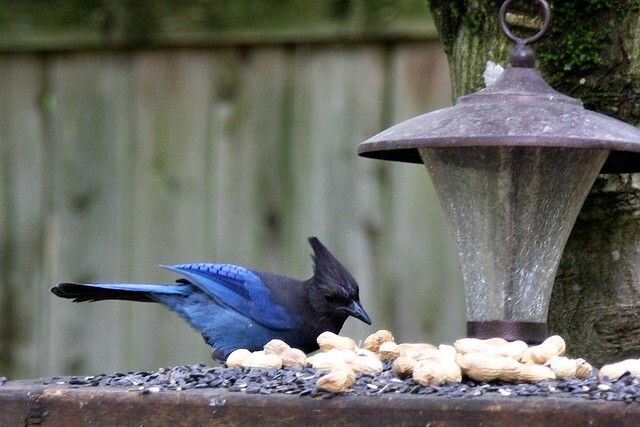 I have Camp Robbers and Steller Jays in my yard too. I only wish I could put feed out, but unfortunately, the darn SEWER rats come into the yard if I do. As long as no food outside, they stay away. Too many waterways around my house. I try to have a critter free yard and just enjoy the birds as they swoop down to enjoy the Magnolia Tree. 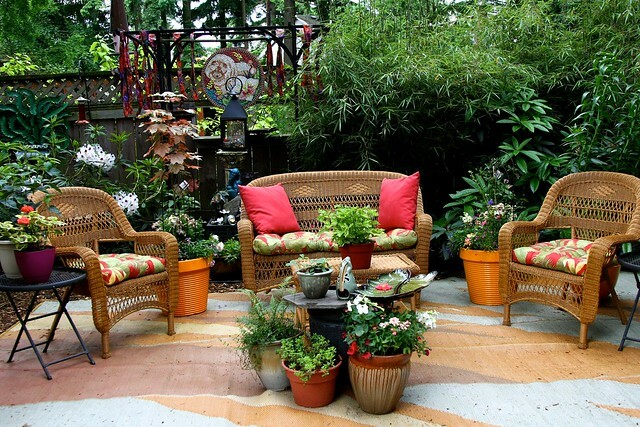 Wonderful pictures. I have a pair of cardinals that are always “sharing” with 3 squirrels. Have to bring the feeders inside at night because a huge raccoon found them. Thanks you guys for the comments!!! I know all about those sewer rats Mary. 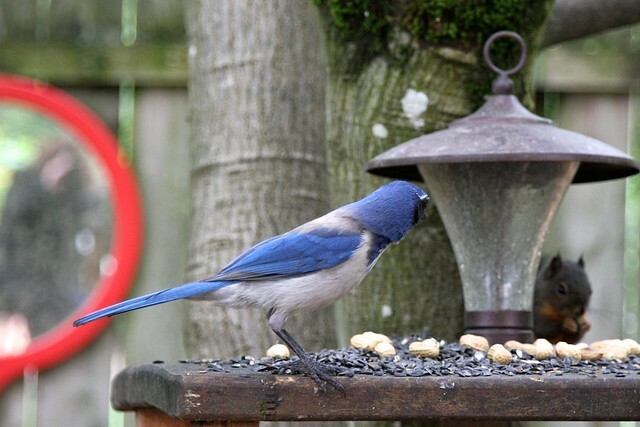 We had a baby boom a few years ago and I had to put the feeders away. I ended up bringing back in just thistle for a while, then added finch seed and kept the “meaty” seeds out of the feeders (peanuts ,sunflower etc). That seemed to do the trick, but we keep a sharp eye out for them all the time. Lillian is a master at catching them but I don’t like her anywhere near the nasty things. Oh how I wish we had cardinals here Claudia. I heard one on tv a couple of days ago and forgot how much I missed their call. In the midwest there are so many!! !